There are four species of anteaters—the giant anteater, southern and northern tamanduas, and silky anteaters—and all of them are totally awesome. Here are 15 reasons why. 1. Their tongues are ridiculous. They start at the anteater’s breastbone and can extend up to two feet long. Their tongues are also covered in backward-facing spines and super-sticky saliva for maximum bug collection. 2. They’ve got no teeth. 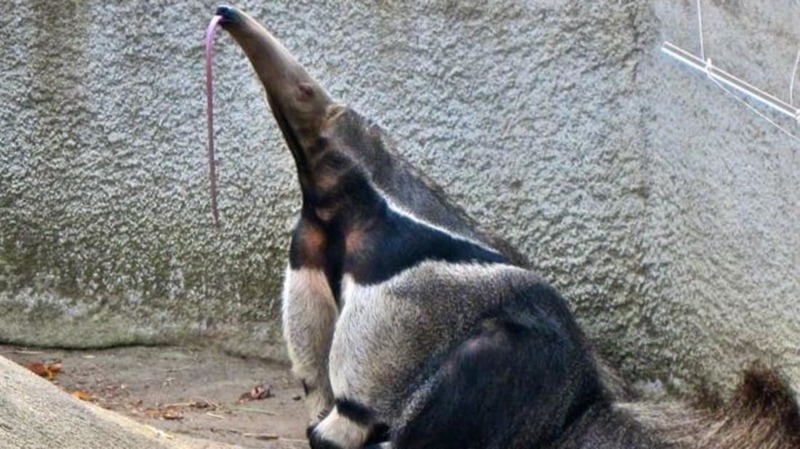 After sucking that absurd tongue back into its face, an anteater swallows its food whole. The bugs travel down into the anteater’s stomach, where super-strong muscles grind them up. 3. Their legs look like panda faces. Once you’ve seen it, you can’t unsee it. This patterning is part of the giant anteater’s protective coloration. Mothers carry their babies on their backs. The little anteater’s coloring is similar to its mother’s, which allows the baby to vanish and simultaneously makes its mother look bigger. 4. They’ve got fistfuls of knives. The paws of all four species are tipped with enormous, knifelike claws so long and sharp that the anteaters have to walk on their knuckles or wrists to avoid stabbing themselves. 5. They don’t want to be friends. Anteaters are not social animals. They avoid humans and other animals, including each other. Adults typically come together only to mate, and even then they're apathetic at best, and hostile at worst. One researcher noted that both the male and female in a pair of tamanduas continued foraging for insects as they did the deed. In between rounds, they swiped at each other with their claws. 6. They really, really don’t want to be friends. They won’t attack unless they feel threatened, which is lucky for us; when they do, it’s often lethal. A defensive anteater will rear back on its hind legs, use its tail for balance, and come out swinging with those fistfuls of blades. Giant anteaters have been responsible for at least three human deaths, and all three anteaters had been cornered. There’s a lesson to be learned here. 7. They’re a crowd favorite … barely. 8. 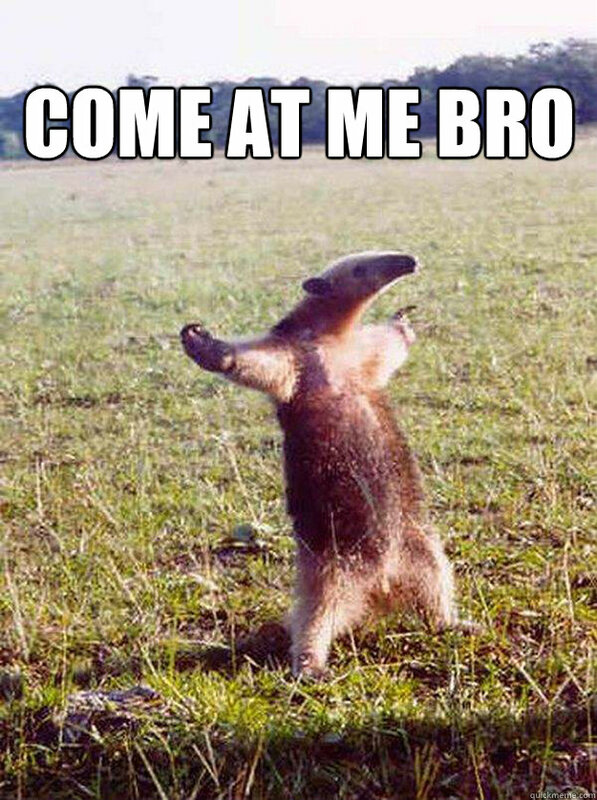 Tamanduas are also not to be messed with. They’re known locally as the “stinkers of the forest.” When in danger, the tamandua starts hissing and detonates a skunk-like stink bomb from a gland under its tail. This is a surprisingly common (but unsurprisingly effective) skill in the animal kingdom. 9. “Giant” is not an exaggeration. Giant anteaters average between six and eight feet long and can weigh up to 140 pounds. They can eat up to 30,000 ants a day. 10. They’re on a sustainable diet. Tamanduas and giant anteaters feed from a termite mount or anthill for less than a minute before moving on to the next one. This is likely because they have about 40 seconds before the insects inside figure out what’s going on and mount a counterattack against the anteater’s vulnerable tongue. Still, these short visits keep the anteaters from ever totally decimating a colony, which means that there’s always more for next time. 11. The Surrealists loved them. 12. They keep their private parts extra private. Male anteaters keep their testicles inside their bodies. When the first anteater specimens were brought from the New World to Spain, the Europeans took this absence of visible junk as a sign that all anteaters were female. Continuing this line of rigorous inquiry, they decided that the anteaters must mate through their noses. 13. The silky anteater is painfully cute. They’re also tiny, weighing in at less than a pound each. These little creampuffs are arboreal, spending their entire lives high up in the trees. They especially like the ceiba tree, whose fluffy golden seed pods provide the perfect camouflage. 14. That doesn’t mean they’re pets. Before you ask: no. Sorry. You can’t have a silky anteater. First of all, they’re incredibly secretive—so secretive that scientists know almost nothing about them. They can’t even get a decent head count. Second, silky anteaters need to live in the wild. Even if you found one and took it home, it wouldn’t survive more than a few days in captivity, and then you’d feel like a jerk for taking it out of its fluffy tree. 15. Meeting a silky anteater is apparently a religious experience.